South Australia and Victoria. Served as Medical Officer in the Middle East, including Gallipoli, in World War 1. The youngest child and fourth son of Johann and Anna Zwar nee Kaiser. Bernard was the last of 13 children born to Johann Zwar. Of the three girls from the first marriage, Maria, the eldest was 28 years old and married, another married the same year as Bernard was born, and the other one presumably was still at home and helped Anna look after her seven children. Bernard was the youngest of the seven children born to Johann and Anna Zwar, nee Kaiser. The oldest child, Johannes, was 12 years old when his youngest brother Bernard was born. The birth certificate records the birth of Traugott Bernhard Zwar on 20th June 1876 to John and Anna Zwar formerly Kaiser. His father’s occupation is listed as “Homeopathic Doctor”. Later in life he shortened his name to Bernard, and gave Traugott as his second name. Bernard went to the Ebenezer Lutheran Church School where they were taught in German, and then to the Stockwell State Primary School. John Dallwitz later recalled how he would walk with Bernard and Hermann Zwar from Ebenezer to Tanunda to school on Monday mornings and return on Fridays. Bernard then attended Prince Alfred College in Adelaide. One of his school reports “… shows that he was a bright boy who excelled in German”! Bernard was keen to study for the Lutheran ministry. However this would have meant going overseas to either Germany or the U.S.A. His older brother Hermann had begun studying medicine at the Adelaide University so Bernard decided to join him. He began his medical studies in March 1895. Three years later a row developed at the Adelaide Hospital and the Clinical School was closed. The senior students moved to either Sydney or Melbourne. Medical practice has come a long way since Bernard entered the profession. About the time that Bernard was born the doctors in the Western World were debating the value of Lister’s published theories on aseptic surgical techniques. Lister’s theories on antiseptics received a lot of opposition, particularly in England, his home country. When Bernard was 10 years old a house surgeon at the Melbourne Hospital reported on operations performed there, and made special mention that “in none of these cases was the spray used.” When Bernard graduated there were older surgeons who still had some doubts about the claims of ‘Listerism’. Bernard’s immediate family lived in the Barossa Valley in South Australia. He would try to write to them on their birthdays, and also gave them medical advice. He sent his brother some ointment to treat his corns. Bernard also had many relatives living in Victoria. On his mother’s side, Uncle Andrew Kaiser had settled in Hawthorn. Auntie Maria Kaiser had married Johann Hirt and they lived near Ballarat. On his father’s side, his oldest half-sister Maria had married August Petschel. They lived on a farm near Dimboola. His uncle Michael Zwar had settled at Broadford. When he lived in Melbourne Bernard had Zwar cousins living in Broadford, Beechworth and Preston. In the early days he would go to visit the cousins at Broadford by train. In a letter to his parents he mentioned that he went out hunting with three others at Broadford and within several hours shot 40 to 50 kangaroos, 4 hares and a fox. At one stage he courted Ada, the youngest of Michael Zwar’s children. He and Ada went to the Barossa Valley to visit Bernard’s parents, but his father would not allow them to marry as they were first cousins. The two remained good friends over the years. Over the years Bernard would medically treat many of his relatives as well as other Wends. They looked up to him with a great deal of respect. In time they would proudly boast if a member of their family had been operated on by Dr. Bernard Zwar. At the conference Bernard was able to converse with the world famous Bacteriologist Dr Robert Koch. Bernard worked at various hospitals in London. For a time he was clinical clerk to Sir William Gowers at the National Hospital, Queen’s Square. During his time in Europe Bernard visited his relatives in Saxony. It was 54 years since his father had left Saxony. Bernard took a photo of the house in Drehsa where his father had been born. He also took a photo of his uncle and aunt, George and Anna Kaiser, along with their daughter and her husband, Mihan, holding their baby daughter Lenka the day after her baptism in 1905. 87 years later (in 1992) Lenka made contact in Australia with her relatives and was amazed when she was sent a copy of the photo for identification, and saw her baptism photo. The relatives in Lusatia treasured this visit by Bernard. In future years they would always ask about him in their letters to Australia. They always looked forward to receiving letters from him too, but his parents would reply that he was a very busy man, and they also did not hear from him as often as they would like. In fact his parents hoped that he would one day set up a practice near them in South Australia. Bernard explained to them that his work would be centred in Melbourne. He had completed his studies there and made good contacts there. Bernard’s ship landed in Melbourne on 18th December 1905. He went to the Barossa Valley and spent 3 days with his parents to tell them about his trip and report on their relatives. He had photo’s of the relatives in Saxony, the village of Drehsa and the Zwar house still standing there. (The house was demolished a few years later). It seems that contact with the relatives in Germany continued until the 1930’s. Gradually the letters were less frequent, the older people died and their descendants did not personally know their relatives overseas. Then the War came and there was no contact with the Zwar relatives for over 50 years, until 1984, and the Kaisers even later, until 1992. Bernard returned to Melbourne early in 1906 and went on to build one of the most distinguished careers in medicine in Australia as a surgeon and administrator. It is difficult to give a summary of his life’s work and still do justice to his many achievements. A glimpse of his status may be gained from the fact that when Don Bradman was in Melbourne and needed medical attention it was Bernard who treated him. A portrait of Bernard, painted by Mr. Charles Wheeler, was hung in the main entrance to the Royal Melbourne hospital as a tribute to his outstanding service to the Hospital over a period of 46 years. The lieutenant Governor, Sir Edmund Herring, officially unveiled the painting several months before Bernard died. After recent renovations the portrait was moved to take centre place in the Historical Room. On his return to Australia Bernard gained the degree of M.S. in 1908, and joined the staff of St. Vincent’s Hospital in Melbourne, as surgeon to out-patients and junior surgeon to in-patients in 1909. The reason for this belated letter is not that I had forgotten the date of your birthday. I had planned that it should reach you on your birthday. During the last few days I have been so busy with sick cases and operations that I didn’t have a minute to spare to write, so I had to be content to send a telegram. I would love to have visited you and personally delivered my good wishes. It is almost unbelievable how difficult it is for me to get away from my work and for this reason it was impossible to come. Although somewhat delayed, dear father, I wish you God’s blessings for the year you have just begun. May the Heavenly Father guide you with his protecting hand. My heart is full of thankfulness, firstly to God who has kept you with us so long, secondly, to you dear father for all the love and care you have given me. Heartfelt thanks for this dear father. As for myself I am very well and I hope these few lines find you the same. In 1911 Bernard was appointed as the Honorary Surgeon to Outpatients at the Melbourne Hospital. He visited his parents at Easter but could only stay for several days. He had found the work difficult in his first years. He wrote to his parents that his situation had improved. The following year he also joined the Australian Army Medical Corps with the rank of Captain. Bernard’s father died in 1912. He had visited his father shortly before his death, and then returned to Ebenezer again for the funeral. “The following are the result of careful personal enquiries from the first 300 patients under my charge in No. 2 ASH Jan. 1915. The vast majority were youths, some still in their teens, others in the early twenties – 85.3 per cent had been infected for the first time. 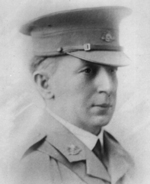 Bernard returned to Australia in 1916 and continued as a Temporary Area Medical Officer until 1921. On his return from the Middle East he went to South Australia and spent four weeks with his mother who was now in her eigthieth year. She died in June the following year. Bernard had travelled to the Middle East on the same troopship as a young nurse, Essy Craig, whom he had met at the Melbourne Hospital. On his return to Melbourne in 1916 they renewed their acquaintanceship and were married on the 4th of May. From 1918 to 1927 they lived at 54 Collins Street next door to the Melbourne Club. When World War II began the members of the hospital Red Cross Auxiliary formed a sewing group. They met in the Zwar home every Friday during the War. In 1918 their only child John was born. In the detailed report that follows Essy does not say whether they visited the Zwar and Kaiser relatives. Dresden is only about 80 kilometres from Drehsa so it could be assumed that they did call there. Bernard was impressed by the many subjects medical students had to study in different countries in Europe. He was particularly impressed by the practice of students having to gain practical experience in clinical work before they could start their own practice. In Melbourne only the most successful students were appointed as a Resident in a hospital to gain practical experience. The majority went into practice without it, including those who took up solo practices out in the country towns. When they returned to Melbourne they lived for a brief time in a flat at St. Carol’s, South Yarra. Bernard had bought land at Malvern and had a home built there. They moved into it in 1928. They had a great love of flowers and gardening and he developed a beautiful garden that gave him much pleasure for the rest of his life. Bernard, or ‘Zeddie’, as he was affectionately known to his friends and students, continued his work at the Royal Melbourne Hospital. One of his greatest achievements was to have a new Melbourne Hospital built on a site next to the University. Bernard had an amazing memory. During meetings he could accurately quote from memory the dates and contents of letters that passed between different bodies in previous years. Deputy Chancellor of the Melbourne University for two years (1943,44). Stewart Lecturer in Surgery at the university from 1924–1935. This involved, besides lecturing, much examining duty. The latter work, owing to the absence of many examiners on war service, he continued to perform until two years before his death. Member of the Standing Committee of Convocation, 1924, 25, was elected to the Council in 1935, and, being re-elected, remained a member until his death. He served through all these years on the Faculty of Medicine. President of the Melbourne Medical Association in 1922 and 1923 and of the Melbourne University Association in 1935. Chairman of the Nurses Board of Victoria in 1924-1927. One of the founders of the Royal Australasian College of Surgeons and a member of the Board of Censors, a member of the medical board of Victoria, and of the Advisory Committee to the Repatriation Commission, a member of the Anti-Cancer Council, and Honorary Treasurer of the Medical Defence Association of Victoria. Bernard was made a Companion of the Most Distinguished Order of Saint Michael and Saint George in 1941. Dr. Bernard Zwar died on 16th January 1947. “He had many other interests outside his professional and hospital activities. He put the same intensity and enthusiasm into his games as he did into his work. He loved his tennis and golf and was the moving spirit in the circle of enthusiasts with whom he played. He was an active member of the Wallaby Club for many years and intimately knew most of the walks and beauty spots within a day’s journey of Melbourne. The funeral service was taken by the Rev. Dr. John Mckenzie in the Toorak Presbyterian Church where the Zwar family worshipped for many years. It was the express wish of Bernard that his funeral should be short and simple and that no word of exaggerated praise should be used in describing his character and work. Bernard had been thrilled in 1942 when his son John completed his medical studies and graduated with honours and was appointed as a Resident at the Royal Melbourne Hospital. It also gave him great satisfaction to see his son serve in New Guinea as a Captain in the Australian Army Medical Corps. He would also have been delighted to know that a grandson, Robert Zwar, also became a doctor. What makes the achievements of Bernard’s career even more remarkable is that he achieved it all despite his German background and name. He was born in Australia, but his parents had both come from Saxony, and in the War years this was a big handicap for most people in a similar situation. In the famous second referendum on Conscription in the first War anyone with German blood was not allowed to vote, even if they had been born in Australia. (The second referendum was defeated by a greater margin than the first one). Early in his career with the armed forces Bernard was advised that he would not have a career future if he remained a member of the Lutheran Church. He joined the Presbyterian Church and remained a faithful member all his life. However it must have been an extremely difficult and courageous step for Bernard to take. His parents were both zealous supporters of the Lutheran Church and Bernard himself had at one stage wanted to become a Lutheran Pastor. The Royal Melbourne hospital has a historical section with information and memorabilia on Bernard. It includes a school report from Prince Alfred College, one of his notebooks from his time at the Adelaide university, photographs, including Bernard in a handsome new car, and as one of the “Victorian Medical officers Bound for the Front”. It also has his own wartime photo album, and his first wooden stethoscope. An Address by B. T. Zwar, M.D., M.S. (Melbourne, Retiring President of the Victorian Branch of the British Medical Association. Delivered 4.12.1929 at the Annual Meeting. Reprinted from The Medical Journal of Australia, December 21, 1929. By B.T. Zwar. Reprinted from ‘The Australian and New Zealand Journal of Surgery, Jan., 1933. An Address to the Nursing Staff of the Royal Melbourne Hospital. B.T. ZWAR. From an account written by Arthur Zwar, in the possession of Kevin Zwar. “The Leader” Newspaper. Angaston 23.1.1947. From an article written by Bernard’s son John and published in “CHIRON” Journal of the University of Melbourne Medical Society Volume 2 Number 1 1988. Letter held by Kevin Zwar. Quoted in “The ANZACS” Patsy Adam-Smith pages 69,70.
. A four-page typed manuscript, without author’s name. ”Written in 1957″ is pencilled in at the bottom of the last page.